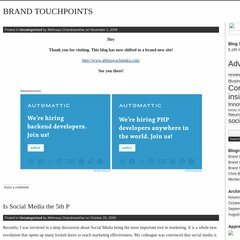 Topics: Brand Touchpoints, and Business. Abhinayachandra.wordpress.com's server IP number is 76.74.254.120. It is hosted by Peer 1 Network Inc (New York, York,) using nginx web server. PING lb.wordpress.com (76.74.254.123) 56(84) bytes of data. A ping speed test response, is timed at 44.0 ms.